The Section is under attack from an unknown enemy. The only lead they had was a man called Bremer (Peter Welch) who committed suicide whilst being interrogated by Meres and another agent called Gould (Henry Knowles). But before Bremner died he did divulge one important piece of information – a foreign agent tasked with liquidating all the members of the Section is somewhere in London. Let’s Kill Everybody was the first of five scripts written by Ray Jenkins. He would also contribute Death of a Friend later on during the second series as well as two excellent stories for the fourth series (Rules of the Game and If He Can, So Could I). His other script was Amos Green Must Live for series three, which proves that even good writers can have their off days – but we’ll leave the problems with that one for another time. This episode was the final story to feature Michael Goodliffe as Hunter. As he only appeared in five stories (You’re Under Starter’s Orders was sadly wiped) he maybe didn’t have quite enough time to establish a distinctive performance (although he was always very solid). Red Knight, White Knight implied that he was more of an administrator, with little practical knowledge of how the Section worked, but this was rarely touched upon subsequently – in later episodes he proved to be just as ruthless as Ronald Radd’s Hunter. The next Hunter would be very different. 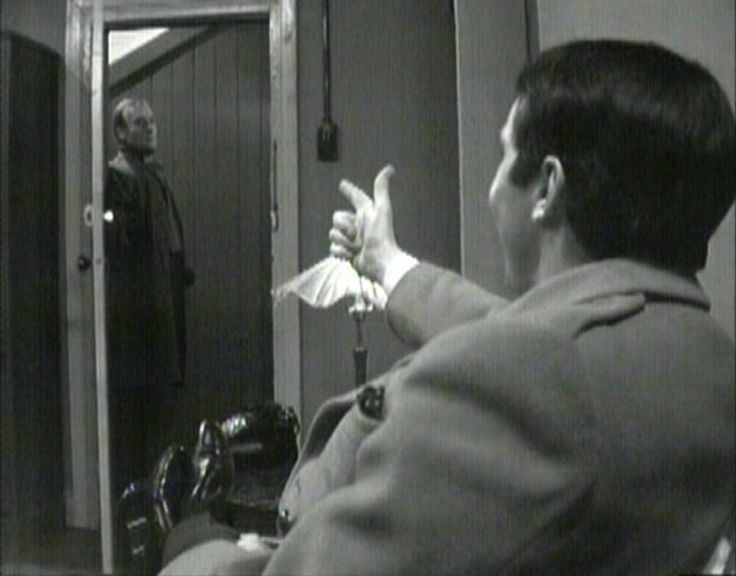 so it’s tempting to think that Goodliffe’s more autocratic Hunter (similar to Radd’s performance) was needed as a stop-gap during the early part of series two, whilst Callan was re-integrated into the Section. This then gives Derek Bond’s approachable Hunter even more of an impact. At the start of Let’s Kill Everybody, Callan is a happy man. He’s just started a relationship with the gorgeous Jenny Lauther (Hilary Dwyer). Jenny was a nurse at the clinic where Callan had recently been sent for treatment (to have a cyst removed). Callan’s on sick-leave and is planning to spend it in Jenny’s company when Hunter calls him into the office. Hunter quotes “Emergency D” which brings an instant response from Callan. Hunter asks Callan if he’s made any new contacts with the last few weeks – Jenny is the main one. Could she be the assassin? On the face of it, it seems ludicrous, but Callan has to be sure. He does it in the only way he knows how – by asking her point blank and searching her bag. This upsets Jenny as she sees the affable man she loves transformed into a cold, relentless interrogator. It’s another indication that normal human relationships are always going to be something that Callan will struggle to maintain. She appears to be completely innocent – as the assassin turns out to be German academic Dr Paula Goodman (Heather Canning). Dr Goodman is Jenny’s tutor (she resigned from the clinic to re-enter higher education). One of the flaws of the story is that although we see Hunter with a file on Goodman early on, he doesn’t make any attempt to have her picked up until much later. And was it just a coincidence that Jenny was placed with her or did Jenny’s relationship with Callan have something to do with it? Poor Jenny seems to be another innocent caught in the crossfire, as Goodman drugs her so that she later drowns whilst canoeing. Edward Woodward’s barely controlled fury when he realises that Goodman killed Jenny is a highlight of the story, as is the scene where Goodman sows seeds of doubt about Jenny’s loyalties in Callan’s mind. Jenny was a toy. A doll. A doll with an ear for private phone calls. No intelligence, no brain, nothing to match that obscene English exterior. Just a reporting doll. Wound up and taught to walk back to … who? That worries you, doesn’t it? Which side was she on? Was she one of us, but expendable or was she … ? It’s easy to form the impression that the Section is a little short on good men apart from Callan and Meres. It isn’t the first time we’ve seen other operatives rather easily dealt with – and their security procedures (one man covers another) does seem to be woefully inadequate to deal with the current crisis. It’s also a little strange that the job of killing all the members of the Section is given to just one person (although late in the story it is revealed that Goodman does have backup). These quibbles apart, it’s a tense story with Hilary Dywer making a good impression with her limited screen time.